Top 5 Things To Do in Vegas! Las Vegas brings to mind a 24-hour casino and party scene more suitable for bucks' and hens' nights, rather than family fun and entertainment. Amanda visits the city of excess and discovers that there is something for everyone to enjoy. When the hubby first told me that we were going to Las Vegas, I was not particularly excited. After all, I don't enjoy gambling (it's the risk adverse lawyer side of me) and I left my wild partying days back at university. After spending three nights at the Bellagio and having a ball, I realize I've misjudged Vegas. Vegas is an entertainment city, and that is clear from the abundance and variety of shows on offer. For anyone who enjoys magic or for the young at heart I would highly recommend Penn & Teller's show, playing at the Rio (one of the highlights is the chance to meet and greet Penn and Teller after the show). And of course, who can resist one of Cirque du Soleil's stunning displays of athleticism and art. Make sure you book tickets well in advance, so as not to be disappointed. I made the mistake of booking flights before double checking when Cirque de Soleil's "O" was performing, and we missed out on seeing it this time - it is the hubby's favourite Cirque show. Instead, we saw La Reve ("The Dream") at the Wynn, a whimsical and theatrical production featuring aquatic elements, acrobatics and dazzling gymnastics. An iconic staple on the Strip, this is one of the best things you can do in Vegas for free. Everyday, the Bellagio fountains put on a beautifully choreographed display accompanied with different musical themes. Depending on the time, the wait time between shows is 15 minutes (between 8pm and midnight) or half an hour (between 3pm and 8pm on weekdays, and between 12pm and 8pm on weekends and public holidays). Given the extravagance of Las Vegas, it's no surprise that you can find some excellent restaurants here, and more than one will probably be at your hotel. 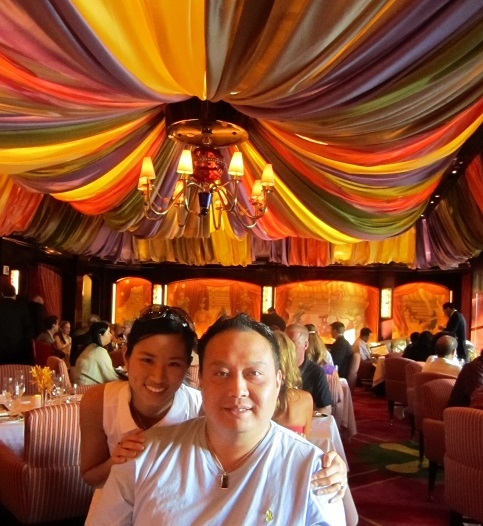 Since we were staying at the Bellagio, we decided to try Le Cirque, an AAA Five Diamond restaurant serving French cuisine. The restaurant setting was jaw-dropping, with the circus theme taken seriously - the dining room even had its very own big top! Worth it if just for the celebratory and fun ambiance, but the food was top notch too. One of our other memorable meals was by the Bellagio pool. We had brunch here one day and the fresh, generous portions of food and outdoor garden setting were amazing (right by the pool, and great for people watching too). Apart from five star hotel dining, another place I would recommend to anyone visiting the States is In and Out Burger. These famously quality burgers are produced in a fast food setting, guaranteed to hit the spot. Originally from California, there is an outlet close to the Las Vegas Strip at 4888 Dean Martin Drive. The US is a shopper's paradise - not least because of its feel good sizing chart and no GST on clothing. Las Vegas is no exception, and you'll find factory outlets on both ends of the Strip selling recognized brands such as Polo Ralph Lauren, Calvin Klein and Dolce & Gabbana at a fraction of their usual retail price. We visited two of the premier factory outlets: Las Vegas North Premium Outlets and Las Vegas South Premium Outlets. Sporting my new pair of Lucky Brand denim shorts I picked up from the outlets! For a different kind of adrenaline rush, one of more exciting things I did on this trip was shoot a real gun. We went to The Gun Store, and I have to commend the range instructors for being so professional and patient, despite my shrieks. I was surprised by the force of the recoil and the noise (you really need those ear plugs). I also liked that the shooting range was set up so that each group had its own private room and instructor. The Gun Store has a variety of gun types and packages to choose from (starting from US$79.95), and we ended up trying a hand gun, a machine gun and a shotgun. Not for the faint of heart, but certainly different!